The Scorpion toe a delicate line. Though motivated to gain greater power, unchecked ambition can be dangerous to the clan. Previously unheard-of prestige in the Imperial City of Otosan Uchi has tempted some Scorpions to further their own goals, independent of the clan. As their power continues to grow, who will keep these Scorpion in check? 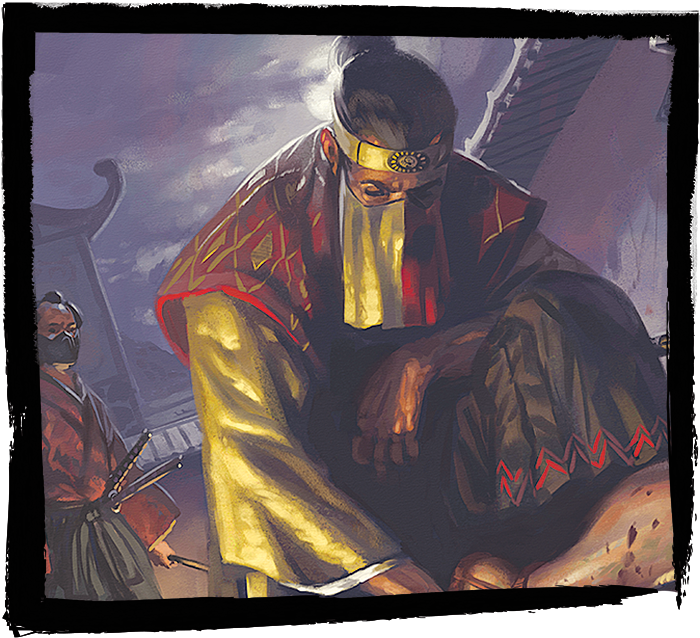 Join us today for a letter from Scorpion Clan Champion Bayushi Shoju, and the impact it will have at the 2018 Winter Court World Championship for Legend of the Five Rings: The Card Game! This letter details the challenges facing the Scorpion Clan, and can be downloaded here (6.6 MB). When you’re finished reading, continue on to discover the choice awaiting the Scorpion at the 2018 Winter Court! As the Scorpion Clan’s dominance of the courts continues to draw attention, the liars and schemers of the Imperial Court look toward their own ambitions. Clan Champion Bayushi Shoju will have no part of that and will monitor his own clan’s samurai to ensure that ambition does not undermine the needs of the clan. At the 2018 Winter Court World Championships, the top performing Scorpion player will be given the opportunity to choose what kind of samurai (by family) is to work with Bayushi Shoju to maintain loyalty among the Scorpion Clan. To help offer guidance in the selection of a samurai for the task, here are brief summaries of what the different options mean with regards to the outcome of the decision. If selected, a samurai of the Bayushi Family cuts down disloyalty with swift decisiveness. If selected, a samurai of the Shosuro Family remains in the shadows, wholly unknown until the disloyal are struck down. If selected, a samurai of the Soshi Family walks among the clan, unrecognized, and reports disloyalty to Shoju for his retribution. If selected, a samurai of the Yogo Family is willing to sacrifice everything and anyone to fulfill their duty. How will the loyalties of the Scorpion Clan be tested in the time to come? As the Scorpion's power continues to grow, their loyalty will be put to the test. Which family is cunning enough to fulfill their duty to the clan? Find Fantasy Flight Games on Twitter to voice your support for a family, and tune in on Twitch November 1 – 4 to discover the fate of the Scorpion at the 2018 Winter Court World Championship!